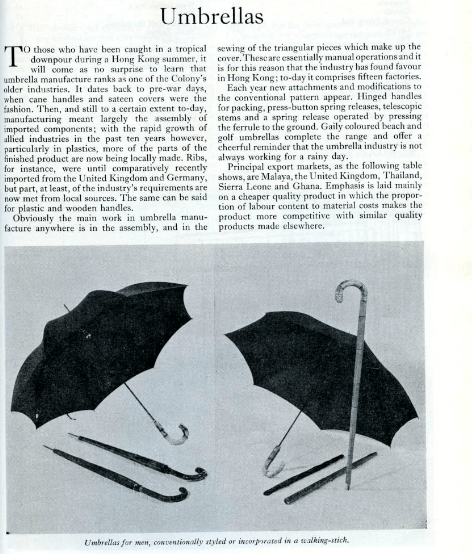 Hugh Farmer: These pages from a HK government publication of December 1959 describe changes in the the manufacture of umbrellas in Hong Kong. Pre WW2 almost all parts were imported, by the time of this report however, at least some were being produced here. 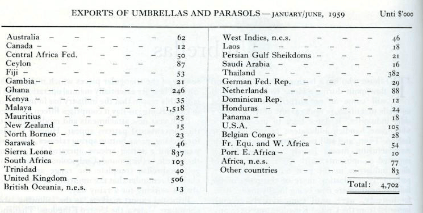 and secondly the list reveals how many countries have changed their names or ceased to exist under the names given in 1959. For example, British Oceania, the Central African Federation, Ceylon, North Borneo, Sarawak and the Persian Gulf Sheikdom. This article was first published on 4th December 2013.